Ageing dogs over 10 years very commonly develop cataract, caused by the opacification of the lens in the eye. 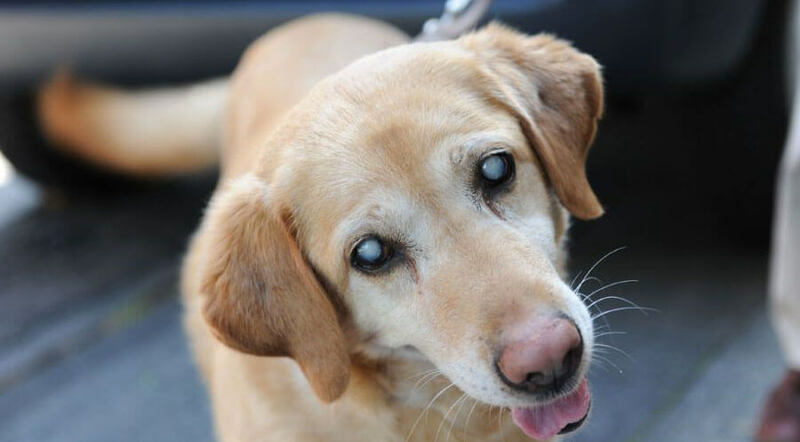 When cataracts affect both eyes, the dog becomes almost completely blind. Here, regular check-ups are necessary to help your dog overcome this eye problem. The eye lens, which is located just behind the iris, is continually growing. New cells are constantly deposited on the surface, but the old ones stay. Over time, the lens structure becomes increasingly dense and eventually loses its transparency. Towards the end of this process, this infection of the dog’s eyes will take on a blueish tint and his vision will progressively deteriorate. Cataracts develops more quickly in dogs suffering from diabetes mellitus. In this case, the opacification of the lens is due to an excess of glucose in the blood. Cataracts in dogs can develop within a matter of weeks due to the metabolic by-products accumulation in the lens. Cataracts can be surgically treated in dogs¸ as in humans. When your dog is 6-7 years old, get your vet to check his vision. When surgeries were undertaken at an early stage of the disease, results were seen to be positive in 80% of cases. Younger the dog, greater the chances of success. Cataracts is a consequence of free radicals continually attacking cells. Free radicals cause chain reactions that initiate the process of oxidation. Their production accelerates with age. Vitamins E and C, grape or green tea polyphenols, taurine and lutein are all examples of antioxidants. Lutein is a natural pigment found in the retina and crystalline lens of the eye. By including antioxidants in your dog's daily diet, you can help improve his body's reaction against the oxidation process.